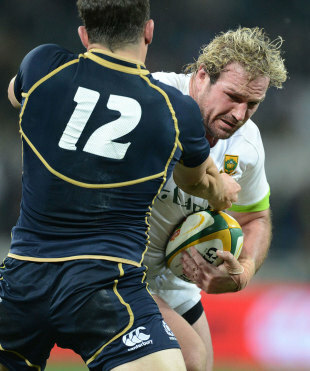 South Africa claimed a hard-fought 30-17 victory over a brave Scotland at the Mbombela Stadium in Nelspruit on Saturday. Scotland delivered a hugely improved performance on the second game of their tour, but it was not enough to prevent defeat at the hands of the hosts. The tourists now meet Italy next week in Pretoria to try to avoid finishing last in the four-team tournament they have been taking part in. At least they approached today's Nelspruit match with more fire and venom than they had produced in their tame game against Samoa the previous week. The tackling was determined and the attacking play incisive, with captain Greig Laidlaw finding lots of holes around the fringe of the rucks, while Matt Scott in the centre was also creating plenty of problems for the home defence. It had to pay off, first with a Laidlaw penalty after near misses for Alasdair Strokosch and Scott twice. The gap was created by a moment of brilliance from Tommy Seymour, the wing winning his first cap, who spotted a gap, ran through and chipped over Springbok full-back Willie Le Roux. Although Seymour was caught a yard short, Scotland recycled the ball and had a five-man overlap when Scott ambled over the line. South Africa had stayed in touch with a couple of penalties from fly-half Morne Steyn - but when they had the chance to cut the gap to a single point with a third kickable penalty, they opted instead to go for the corner and a line-out maul. This rugged version of Scotland, however, was in no mood to give way to that sort of bullying. They stood firm against two goes at the same tactics before the Springboks lost control and they could hack the ball clear. The Scots continued to produce most of the quality play, but they were also making enough mistakes to keep the Springboks confident. Scotland were also continuing to suffer the injury problems which have been a theme of this tour with fly-half Ruaridh Jackson and flanker Ryan Wilson going off with shoulder damage late in the first half. Despite the reorganisation, though, they still had their noses in front at the break. It was soon to get even better as Tim Swinson, another of the impressive debutants, drove up the middle. Again, though he was stopped a couple of yards short, he had done the damage and centre Alex Dunbar was out wide to finish off the overlap. Scotland's injury woes intensified, though, with Peter Horne, who had replaced Jackson going down with a knee injury and leaving the field. Down two fly-halves, the visitors had to move Laidlaw there and bring Henry Pyrgos on at scrum-half. Not that had had anything to do with South Africa's comeback. Staring an improbable defeat in the face, they raised the intensity, though it was a stupid trip on Bryan Habana that got them into the game. Steyn kicked the penalty into the corner and when Scotland were ruled to have collapsed the maul, referee Roman Poite went straight under the posts to give the home side a penalty try. Seconds later Scotland lock Jim Hamilton was in the sin bin for a push to the face on Eben Etzebeth, his opposite number, and Scotland were back under the cosh. A line-out misfire handed the hosts the ball, they piled upfield, pummelled the Scots line and centre JJ Engelbrecht went over for the score that put them ahead for the first time on the hour mark. The Springboks by now had reverted to the game they know best - plenty of high kicks and mauls - and it seemed to be working for them as Scotland struggled to break out of their own half. The aerial barrage particularly effective in pinning them back and a string of penalties went against Scotland as the pressure told, and replacement fly-half Patrick Lambie kicked one to increase the cushion to six points. In the end it told and replacement centre Jan Serfontein exploited the pressure to wriggle over in the dying seconds to add a scarcely deserved gloss to the result.